With its signature Victorian exterior and modern, high-tech interior, the innovatively designed Best Western Plus Delmere Hotel offers the perfect base for your London vacation. Each room is innovatively designed to create a personalized space in the heart of the city, and features extras such as rain showers, media streaming, smart TVs and touch-controlled mood lighting. Hyde Park is just a stone's throw away, and world-class shopping at Oxford Street is just a short walk from the hotel. 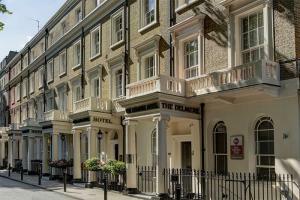 This hotel is a quarter mile from Paddington Train Station, with express service to London Heathrow Airport. Approximately a 3-minute walk minute walk to Paddington Tube Station. Heathrow Airport is 20 miles away by road.